At Sembler, we develop relationships with startups that can benefit from Draper's deep technical expertise. Sembler uses its agility to partner with these companies early and facilitates collaboration with Draper's other program offices to offer our customers and sponsors unique, cutting edge solutions. We connect with our community through sponsorship of organizations such as Greentown Labs and MassChallenge and through mentorship of companies in programs such as Techstars. To learn more, check out the Sembler home page link below. The Sandbox Innovation Fund was established by MIT to spark innovation an entrepreneurship at MIT. It began as a $2 million per year investment into the MIT entrepreneurial ecosystem. The program provides funding (up to $25,000) and resources to MIT student-initiated ideas and in a few short years has funded hundreds of student ideas. The program focuses on giving students the opportunity for a hands on education in innovation. The program is purposefully not a competition and all ideas are considered. ​I was part of the founding group of Sandbox Fellows, experienced entrepreneurs who coach teams that are accepted into the program. Now that I have graduated, I continue to volunteer as a mentor of student entrepreneurs and enjoy every minute of it. 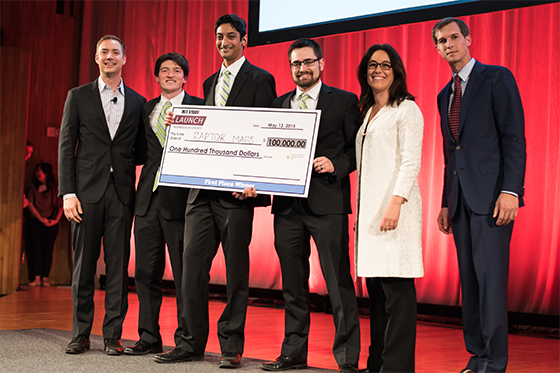 The MIT 100K Competition is regarded as one of the largest and most prestigious student business plan competitions. In the spring of 2015 I convinced my co-founders to enter the competition to give us the structure and additional resources to help formalize our business plan. The experience did that and more. We ended up taking home the $100,000 grand prize. Our story is below. ​Raptor Maps is an agricultural analytics company I founded during my graduate studies at MIT. Our company provides crop management analytics to agricultural businesses to improve crop yields and supply chain management. We collect data primarily through the operation of our custom built drone imaging fleet. Our headquarters is in Somerville, Massachusetts but we provide services across the nation. The origins of Raptor Maps began in the summer of 2014 during a NASA sponsored research trip to the fantastic geologic sites around Pocatello Idaho. Co-founder Nikhil Vadhavkar and I were supporting a simulation of a lunar geology trip armed with path planning software developed in our lab at MIT. An important component of this first excursion to the geologic field site was to collect better topography data to guide future missions. Our NASA collaborators used techniques such as Differential GPS, LIDAR, and most compelling for large scale topography: aerial drone mapping. Nikhil and I prepared a fixed wing aircraft to assist in some of the drone mapping efforts. Unfortunately due to the permitting process to operate our UAV in the national park, we were grounded. As we drove to past the wide expanses of cropland between our hotel and the field site each day we longed to let our plane soar over the open fields. There was something about wide open cropland and our UAV's broad wings that fit so well together. Like a hawk taking flight over open plain, The idea for Raptor Maps took off. We spent the following fall trying to figure out the market, the technology, and what farmers and whoever else was in the value chain wanted. This involved phone calls, lots of e-mails, and trips out to fly our aircraft. By the springtime of 2015 we knew that we were ready to form a company. We decided to enter the MIT 100K entrepreneurship competition, primarily as a way to help us hone our business plan. I recruited our 3rd founder and office mate, Eddie Obropta to the team to help with some of the software work. We drafted up a plan and tossed it in, right on the deadline. A few weeks later we were notified of making the first cut. It was time to get serious. Next it was time to prepare a more defined plan and make our first pitch. I will spare the details for another time, but eventually we made it all the way to the final 8, down from 250+ original applicants. ​After the interruption of applause, we had a quick question and answer session which was cut short by the moderators and then we were ushered back to our seats. All we could do was wait. The other companies gave their pitches, all impressive and with such diversity, including a underwater robotics company and political data aggregation website. After the pitches there was a slight pause in the action for the judges to confer. We were happy to have come this far. The process helped us think thoroughly about our plan and zero in on a market. We had already gotten what we came for. The judges came back out and made their announcement. "The winners of the 25th MIT Entrepreneurship Launch competition is...Raptor Maps"
The 100K check. The actual check came in the mail a few weeks later and was much, much smaller. Now Raptor Maps is a thriving early stage company. We have a great team and are doing our best to feed the world and enable the next tech revolution in precision agriculture. Through this process I have learned so much about starting a business, forming teams, and bringing new technologies to market. While there are a lot of amazing technologies to spend time developing, I have found that a customer first focus to technology development yields the best results. The biggest lesson perhaps is to take a risk and go for it. Learn by doing. If you are considering starting a business I encourage you to let go of your reservations and embark on the great adventure. The Raptor Maps team during a field visit.